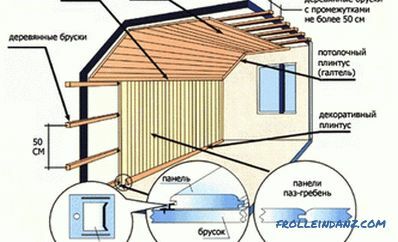 If the kitchen was acquired a long time ago and is made of materials of economy class, for example, chipboard, then the first thing that fails will be the tabletop. Over time, worktops made of more expensive materials will lose their original appearance, and then the best solution is to replace the kitchen worktop. When choosing a tabletop, the first thing to do is to focus not on the appearance, but on the quality of the material from which it is made. This will determine the service life and features of care. Chipboard . Chipboard tops are popular due to their low cost and wide range of colors and sizes. They are heat-resistant materials that do not require special care. 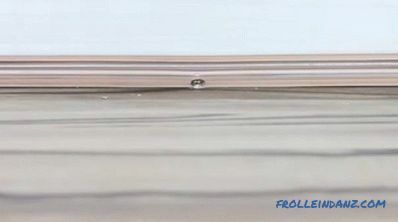 Laminated coating on top sufficiently protects the surface from mechanical stress. The plate can be trimmed with special paper, veneer, film, to create an imitation of marble or other materials. 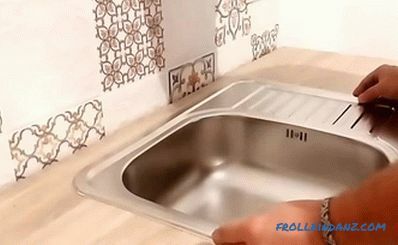 You can change the kitchen worktop from the chipboard by yourself. However, its main drawback is its strong susceptibility to water. 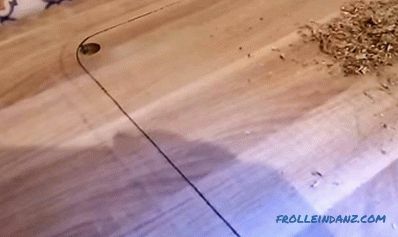 When moisture gets on the non-laminated end, the tabletop swells up, and it is no longer possible to return it to its previous appearance. Therefore, during installation, it is necessary to take particular care of insulating the ends of the plate. Artificial stone . Artificial stone is very similar to natural. It is made on the basis of acrylic and quartz, but is represented by a large number of color variations, due to the possibility of coloring and imparting texture. It perfectly resists moisture and high temperatures. Minor scratches, if they occur, are imperceptible, since the dyeing of the array is carried out through the entire thickness. Special care is not required. 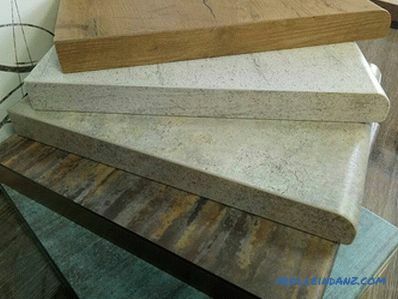 Weight countertops made of artificial stone is not critical, so it can be changed independently. Natural stone . The material is completely unaffected by temperature. However, this material can be fragile and absorbent fat and coloring matter. In addition, the weight of the stone worktop is significant, approximately 50 kg per 1 item meter, and it will cost a lot. 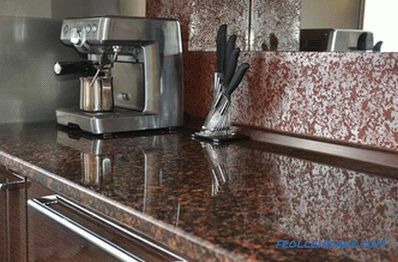 The most common marble, granite, basalt countertops. 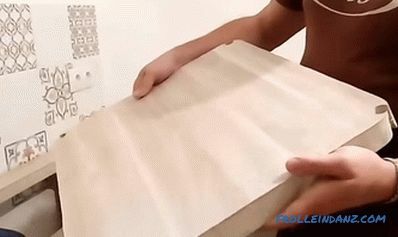 Like artificial stone, natural can be sanded and repaired by gluing. 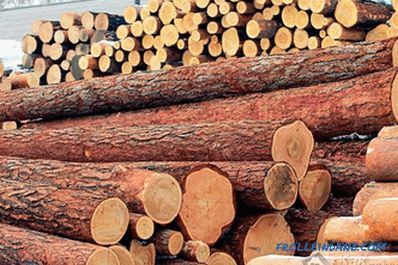 Natural wood is an absolutely eco-friendly material and looks great. But the flawless appearance does not last long. Since wood is a soft material, scratches, cracks and cuts are immediately noticeable on the tabletop. It can also be deformed by moisture. Habitual cleaners can not be used. Special care is required, in particular oil treatment and polishing. However, the dignity of natural wood is also in the fact that it is easily amenable to restoration. 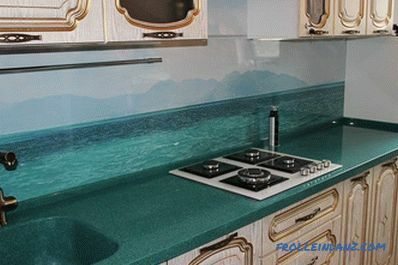 The glass countertop looks unusual, stylish. In operation it is the most hygienic option. On such a surface, microbes and food particles do not accumulate, it does not absorb odors. Great for high-tech style and looks expensive. However, for self-installation is practically not suitable. It requires special care and can crack under the influence of high temperatures. Stainless steel . 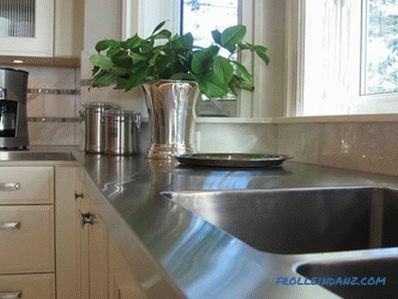 The basis of such a countertop is a chipboard plate, but unlike the conventional laminated plate, a chipboard coated with stainless steel is very practical. Moisture, acids, household chemicals, high temperatures - she is not afraid of anything. The only drawback is the oxidation of products that are cut on such a surface. Choosing a color is a crucial moment as the table top is matched to the ready-made headset and fits into the existing interior. According to the colors of the tabletop should be combined with curtains, furniture, kitchen apron, color of the floor, walls, ceiling. 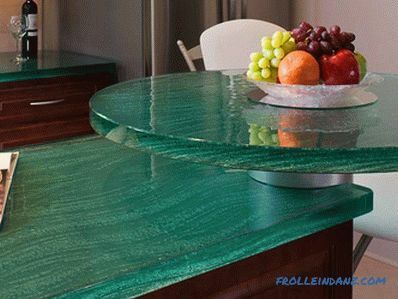 You should not choose a bright tabletop, especially if you used bright colors in your kitchen interior design. When preparing a meal, the look will be directed to the tabletop - your eyes will get tired. Pastel, beige tones will fit in well. In addition, the light surface is less visible stains, small spots, fingerprints. Especially practical from this point of view is the surface with a fine pockmarked pattern. A dark tabletop should be chosen if you want to create an expensive and stylish interior. However, in operation, it will not be very convenient, because all the dirt and defects are visible on the dark surface, especially if it is glossy. For high-tech style, a white or metal tabletop is suitable. If the furniture is dark, then it is better to give preference to beige or peach tones. Professionals and experienced housewives advise you to get a solid worktop that will allow you to combine several lockers together. Firstly, it is convenient in terms of placement of household appliances and cooking - the joints will not interfere, secondly, in the intervals between the tabletops, no matter how insignificant they are, crumbs and similar small garbage will not fall through. Ordering a countertop is necessary that is wider than headsets. It is necessary to choose the size so that it hangs over the furniture fittings, otherwise the clothes will constantly cling to it. In addition, it is recommended to make a canopy on the side of the headset, where it will stand against the wall, since a technological gap is needed between the cabinets and the wall for laying communications, in particular water pipes, gas pipes, electrical wires. The greater the thickness of the tabletop, the stronger it will be. However, when choosing a thickness, you must take into account the height of the gas stove, the thickness of the hob and the sink. Having decided where the worktop will be purchased, it is necessary to make an order, having foreseen the need for preliminary cutting of the material according to the specified dimensions. If the tabletop is solid, then transportation will require transport of the appropriate length. It is necessary to measure the dimensions of the tabletop carefully, to the nearest millimeter. If the manufacturer will make all the technological holes, then you need to know in advance the dimensions of the hob and sink. The tabletop must be transported with assistants to prevent its damage. Any surface can crack, including natural stone. It’s possible to start installing the tabletop by yourself only by fully understanding the technology of performing all the necessary actions. With insufficient qualifications, it is easy to spoil the tabletop. Self installing the countertop in the kitchen is recommended only if it is made of soft materials, such as chipboard or solid wood, as they are easily processed. 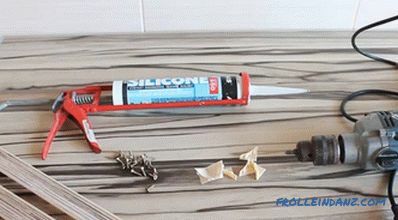 if installation is included in the cost of making the tabletop. 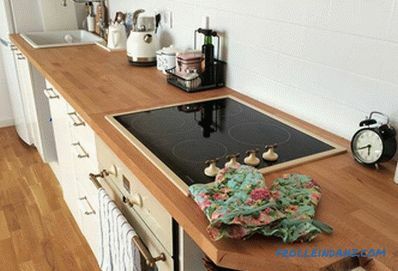 Before disassembling the table top, it is necessary to shut off water, electricity, gas, remove all wires and hoses, remove all contents from the cupboards, remove the siphon from the sink and the sink itself, turn off the cooktop and disconnect from the countertop. Then proceed to the immediate dismantling of the old countertop. It is recommended to remove it carefully so as not to damage the kitchen set itself. Skilled craftsmen advise to keep fasteners, in particular corners, screws, as it can be useful when installing a new countertop or for other purposes. After dismantling, the tabletop is set aside and the fitting of the kitchen set is checked. If necessary, tighten the fasteners, nuts, bolts. They clean the points of contact with the tabletop from the old sealant. 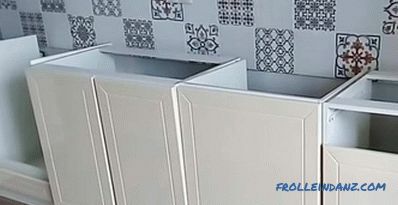 If the tabletop is solid, that is, several cabinets are to be covered at once, then it is extremely important to carefully level the cabinets by level, otherwise the tabletop may burst. Perfect for this long level. When it is laid on stacked tables, no gaps should be formed. Height adjustment is performed using screw legs, and if they are not, then plastic supports are placed under the legs. Bedside tables are connected with screws or clamps. According to the size, make the markup on the table top. If the fit to the size will be done with a hacksaw, it is necessary to mark the front surface, if an electric jigsaw will be used, then the inside should be marked. To make the cut as accurate as possible, it is recommended to stick the masking tape in place of the cut, it will prevent the surface from splitting of the laminated layer. After cutting, it is recommended to smooth out large irregularities with a file. If the tabletop consists of several parts that must be joined together, you need to degrease the ends of the parts and use a sealant or sealer. 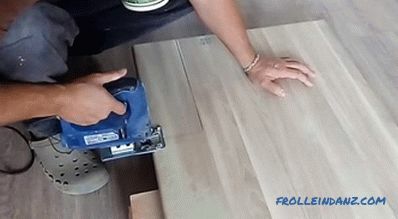 After the quick skating (the sealer quickly hardens), it is necessary to grind the glueing site, then the connection area will not be visible. 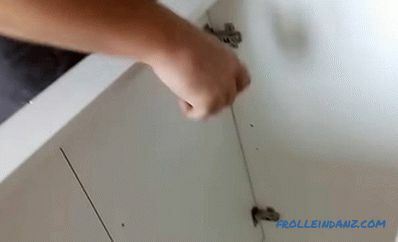 Fix the countertop with the appropriate fastener parts. Gaps filled with sealant or sealer. Then they glue the melamine edge using a hot iron. In places adjacent to the slab, it is better to replace the melamine edge with a metal lining, as the edge quickly peels off from high temperatures. However, it has an advantage, it can handle curved ends. 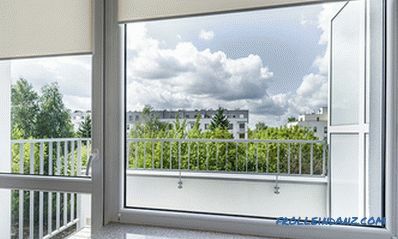 If you install the table top yourself from particularly hard materials, it is better to pre-order the manufacture of all the necessary technological holes in a specialized company. 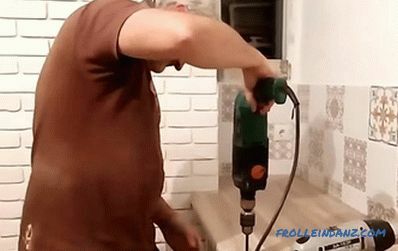 When self-installing, you will need a piece to cut the hole. It is desirable to make a piece for the hob. Experts do not recommend using the old worktop as a template, as during operation there could be an unnecessary backlash. You can simply attach the sink to the countertop, circle and make the size 1.5 cm smaller around the perimeter. If in doubt, it is better to make the size a bit smaller, so that later there would be an opportunity to enlarge the hole. After making the necessary markings, several holes are drilled. An electric jigsaw file is inserted into one of them and a hole is carefully cut out along the marking (the cutting line must be glued with masking tape). To avoid falling out of the cut-out fragment (this may accompany a significant chipping of the slab at the breakpoint), you need to use the help of a second person or as sawing stick it on the back with adhesive tape. 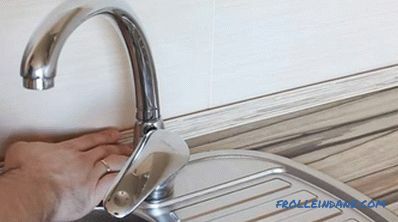 Before installing household appliances in the holes made, it is recommended that the inner edges and those areas that are covered with the sides of the sink should be covered with moisture resistant sealant without sparing material. Rubber cord can be used for sealing. 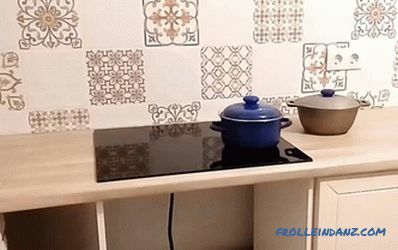 Cut out the hole for the hob in the same way. Installed according to the instructions. The joint of the tabletop with the wall, having previously treated the plate with a sealant, is closed with a decorative plinth. For mounting the plinth, you will need a sealant, a screwdriver, screws and the plinth itself, along with corners and plugs. Screw the baseboard plinth with a screw. The upper profile is mounted on the castle mount. Then a siphon is connected to the sink and a mixer is installed. At the end connect all communications. All operations are recommended to be done carefully, without haste. There is always a risk of damaging the tabletop without the possibility of recovery.